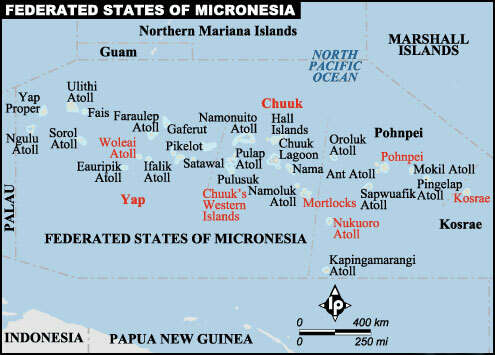 Micronesia, translates to mean "small Islands." Just over one thousand tiny tropical islands make up the amazing diving area that we know as Micronesia. Some of the most well know islands in Micronesia are: Guam, Palau, Yap, and Chuuk (Truk). Geographically, the islands are scattered across the North Pacific Ocean between the Philippines and Hawaii, lying just north of Papua New Guinea. Many of these island and atolls are outcroppings of an underwater mountain system, or the peaking ridge of an underwater volcano. English is spoken throughout the islands, however be prepared to hear some local dialect involving the indigenous languages such as: Palauan, Yapese, and Chuukese. Guam, the largest of the islands in Micronesia, was created by two volcanoes forming a union between a limestone plateau in the northern and southern sections of the island. The island is 30 miles long and 9 miles wide, and is geographically located just below the southern most tip of the Northern Mariana Island chain. White sand beaches line Guam's dramatic coastline, which extend into the Pacific Ocean on the East coast, and the Philippine Sea on the West coast, boosting three hundred varieties of coral teeming with exotic marine life. Guam's time zone is Greenwich Mean Time +10 hours. About 2 hours west of Guam, you will find the more than 200 rock islands of Palau, known as the Floating Garden Islands, which are a collection of round limestone islets covered in thick foliage that seem to float on the water. Meander through these magnificent wonders to reveal white sand beaches, which lead into a amazing blue waters, world renowned drop-offs, vibrant coral reefs, and more than 100 World War II wrecks (ships, planes, and submarines). The three ocean currents that converge around Palau's islands bring some of the most varied marine life in the world, and make most dives in Palau drift dives. Palau's time zone is Greenwich Mean Time +9 hours. Yap, the tiny island made famous for its stone money (Rai), lies 450 miles southwest of Guam and 360 miles northeast of Palau. Rai are giant stone discs that were quarried from the island of Palau and brought back by the Yapese on outrigger canoes. Size, shape, quality/texture of the stones along with the difficulty of acquisition determines the value. The stones are still used as part of dowry and to purchase land, however the stones are not typically moved, they stay placed outside the thatched men's houses and family huts to denote wealth and status. If you have ever wanted to step back in time, then you must visit Yap with its essence of several hundred years past; giant stone money, grass skirts for women, bright colored loin-cloths for men, and traditional rituals. Yap is one of the best spots throughout the world to have the chance to dive with Manta Rays and even catch a glimpse of their cleaning station rituals. Mantas are not the only beautiful thing of this island; it is also famous for its beautiful clear blue waters, teaming with an abundance of reef fish (mandarin fish, lionfish, etc.) eagle rays, sharks, and dolphins. 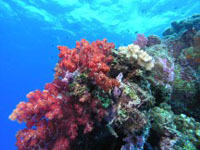 It is no wonder that Yap is considered one of the top diving locations in the world. Yap's time zone is Greenwich Mean Time +10 hours. Imagine an entire Japanese fleet froze in time under water since World War II (1944), and you have just imagined Chuuk (Truk) Lagoon! The islands that make up Chuuk are part of the Caroline Island chain, and encompass 15 large islands, with 192 outer islands and 80 islets. Chuuk lagoon is 40 miles wide and is home to the underwater museum of World War II wrecks (ships and planes), where law prohibits divers from removing any of its relics. The lagoon's waters are warm, clear, calm and sheltered, which produces safe and enjoyable diving, and the perfect conditions for coral to grow from these timeless treasures. Chuuk's time zone is Greenwich Mean Time +10 hours. Micronesia has a fair share of rain throughout the year, however it is rarely heavy, and has an annual rainfall of approximately 80 inches on Guam, 150 inches in Palau, 120 inches on Yap, and Chuuk. This creates a tropical climate with average air temperatures ranging between 70-86F, with a relative humidity of 83%. Typhoons are most frequent between August and December but are rare in Palau. Light and casual clothing is suggested; cotton blouses and skirts for women, slacks and cotton shirts for men. When visiting or staying on the islands, it is considered offensive/inappropriate to wear beach attire outside of the pool or beach area (i.e. city streets, churches, and restaurants). On some of the smaller more traditional islands (i.e. Yap), it is also considered offensive for women to show the upper thigh at any time not swimming, sunbathing or diving; therefore, women visitors should make sure to bring only shorts that are knee length, wrap-around sarongs, long dress, etc. Short-shorts and mini-skirts should not be worn out of respect for local customs. Average water temperatures range around 82F, and water visibility ranges from 50 to 200 feet depending on the island or area that you are diving, as well as plankton bloom.